"I'm a Believer" / "(I'm Not Your) Steppin' Stone"
Monkeemania had reached full swing by the time the album was released. The Monkees' second single, "I'm a Believer"—included on this album—held the number one position on the Billboard Hot 100 and they were about to embark on a highly successful concert tour. The release of More of the Monkees was rushed to capitalize on the band's popularity, catching even its members by surprise. The band learned of the album's existence while on tour in Cleveland, Ohio, discovering it had already been released. They were dismayed by the cover image of them and offended by production overseer Don Kirshner's liner notes, which praised his team of songwriters before mentioning, almost as an afterthought, the names of the Monkees. The band, particularly Nesmith, was also furious about the songs—selected for the record from 34 that had been recorded—leading Nesmith to later tell Melody Maker magazine that More of the Monkees was "probably the worst album in the history of the world". The group began to grow concerned over their musical output, since this album and their debut, The Monkees, featured them limited to just vocals with scattered instrumental contributions. Kirshner had a strict rule that the Monkees were to provide only vocals on his productions, though separate sessions produced by Michael Nesmith himself usually featured Peter Tork on guitar. More of the Monkees has Nesmith limited to one song as lead vocalist. Within weeks of the release of More of the Monkees, Nesmith lobbied successfully with the group's creators, Bob Rafelson and Bert Schneider, for the Monkees to be allowed to play their instruments on future records, effectively giving the quartet artistic control. To make his point clear to Kirshner, who was balking at the idea, Nesmith proceeded to punch a hole in the wall of a suite at the Beverly Hills Hotel during a group meeting with Kirshner and Colgems lawyer Herb Moelis, declaring to the latter: "That could have been your face!". This outburst came after Moelis snapped to Nesmith, "You'd better read your contract", when Nesmith threatened to quit. Kirshner was later dropped from the project altogether. The original pressing catalog number is COM/COS 102. When the album was reissued in 1969 the Colgems symbol replaced the word "Colgems" on the bottom right-hand corner of the reverse side (Catalog number COS 102 RE). It was standard practice for RCA to add an "RE" when any one side of a record sleeve had a revision. There were no mono copies issued in 1969 as they were phased out altogether in 1968. The following tracks were included on the 2006 deluxe edition of the album. Some were previously unreleased, while others were on the 1994 Rhino reissue or the Missing Links series. Studio chatter is included between some bonus tracks. Covered by The Dickies in 1978 on their debut LP The Incredible Shrinking Dickies. While Tommy Boyce and Bobby Hart are the writers of the song, some sites and sources claim Jeff Barry, Angelo Badalamenti and Marianne Faithfull to have co-written the track. These hints are incorrect. Badalamenti and Faithfull did not begin collaborating until the mid 1990s, when they wrote a completely different song called "She". Jeff Barry's work with the band on this and later albums is well-documented (including writing the song "She Hangs Out") and there is no reliable evidence or reason to believe he contributed to this track. "When Love Comes Knockin' (at Your Door)"
The 1990 Arista CD Version features the Extended Stereo Mix, the same that appears in the More Greatest Hits CD Version. "Mary Mary" appeared on the Paul Butterfield Band's East-West release a year before the Monkees' version was released. "Mary, Mary" became a rap hit for Run-DMC in 1988. Despite being the songwriter and producer of the track, as well as being a member of the group, Michael Nesmith did not contribute vocally or musically to this track. Appeared on the flip side of "I'm a Believer"
The original mono and stereo mixes differ slightly in two spots. On the stereo mix, Micky's vocal is dubbed in at the end of the instrumental bridge just before the second verse; this vocal bridge does not appear on the mono mix. During the fade, Micky's repeated, "Not your steppin' stone" begins sooner on the stereo mix than on the mono mix. The mono single fades out earlier than the track from the mono album, despite that both mixes are shown with a playing time of 2:25. 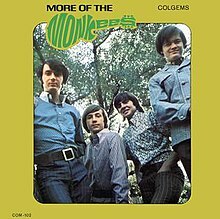 "The Day We Fall in Love"
Intended for More of the Monkees, then put aside and re-cut for The Birds, The Bees, & The Monkees, but then again put aside later for the Instant Replay album. Used in the episode "Monkees in Manhattan"
Originally featured on Missing Links Volume 1, titled "Teeny Tiny Gnome." "Look Out (Here Comes Tomorrow) (Extended Mix - Alternate)"
Same track from 1994 reissue, but in stereo and different studio chatter. Originally featured on Missing Links Volume 2. Originally featured on the Music Box set, remixed in stereo. Later sped up (and mixed in stereo) for Instant Replay in 1969. Previously unissued. Originally featured on the Music Box set. A stereo mix with harmony vocals from Micky Dolenz featured on Missing Links Volume 1. "(I Prithee) Do Not Ask for Love (First Recorded Version)"
Two sessions for Micky's vocals were made. The second (which Micky believed was "terribly out of sync") came in October 1966 and was the basis for the song's 1990 release. A different vocal by Micky was recorded earlier that summer. ^ Brackett, Nathan; with Hoard, Christian (eds) (2004). The New Rolling Stone Album Guide (4th ed.). New York, NY: Fireside/Simon & Schuster. p. 553. ISBN 0-7432-0169-8. ^ a b Lefcowitz, Eric (2011). Monkee Business: The Revolutionary Made-For-TV Band. Port Washington, NY: Retrofuture Products. pp. 74–75. ISBN 0-943249-00-7. ^ "Monkee45s - Albums - The Monkees". Monkee45s.net. Archived from the original on 21 February 2013. Retrieved 18 September 2012. ^ "Monkees on Sundazed". stevehoffman.tv. Retrieved 14 April 2018. ^ "She - The Monkees - LETRAS.MUS.BR". www.letras.mus.br. Retrieved 14 April 2018. ^ Press, Joy (April 1995). "Spins: Marianne Faithfull - A Secret Life". Spin. SpinMedia. 11 (1): 200. Retrieved 12 Sept. 2016. ^ Some sites like the Sunshine Factory, say that Michael Nesmith played guitar on this track, but others like The Monkees Music Vault do not. ^ "RPM: The Monkees (albums)". RPM Magazine. Archived from the original on October 14, 2017. Retrieved April 8, 2017. ^ "Tous les Albums de l'Artiste choisi". InfoDisc. Retrieved April 8, 2017. ^ "Longplay-Chartverfolgung at Musicline" (in German). Musicline.de. Phononet GmbH. Retrieved April 8, 2017. ^ "Norwegiancharts.com – The Monkees – More Of The Monkees". Hung Medien. Retrieved April 8, 2017. ^ "The Monkees Chart History". Official Charts Company. Retrieved April 8, 2017. ^ "The Monkees US Chart History". Billboard. Retrieved April 8, 2017. ^ a b "More of The Monkees - Charts and Awards". Retrieved 24 June 2014. ^ "American album certifications – More of The Monkees – The Monkees". Recording Industry Association of America. Retrieved 23 June 2014. If necessary, click Advanced, then click Format, then select Album, then click SEARCH.